Cause: The error appears when Microsoft .Net Framework is missed from your PC or got corrupted. Solution: Repair or reinstall .Net Framework 2.0 on your system and thereafter restart your pc. Error: On Client PC while running SureTDS an error appears "Error in connecting with database, please verify that your remote PC for SQL Server is working properly". Cause: When the software runs it check the connectivity at startup between the client and SQL Database Server PC. If some problem is found between your SQL Database Server and Client Pc connectivity, this error appears. Solution: User should check the connectivity between the SQL Server Database Server and Client PC using ping command. If still the same error remains, user should contact customer care member with full description of the error. Error: SureTDS gets hang after installing updates at startup. Cause: Error comes due to invalid instance name (SQL Server Name) in configuration file. Error: At software startup during checking for software updates, SureTDS throw an error "Unable to connect remote server"
Cause: If your system is unable to connect SureTDS live updater server, you will see that type of error. Any Firewall may block SureTDS Live updater to install automatic updates. 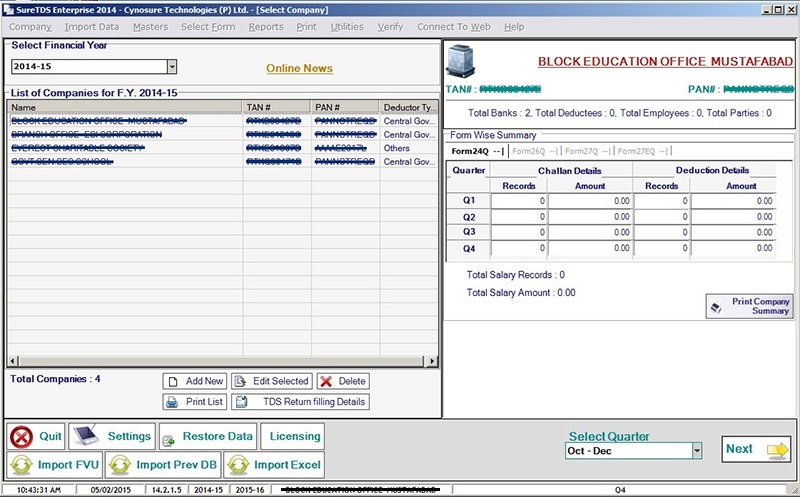 Solution: SureTDS CD key is case sensitive and all the values have to be entered in Capital, and with the Dashes. 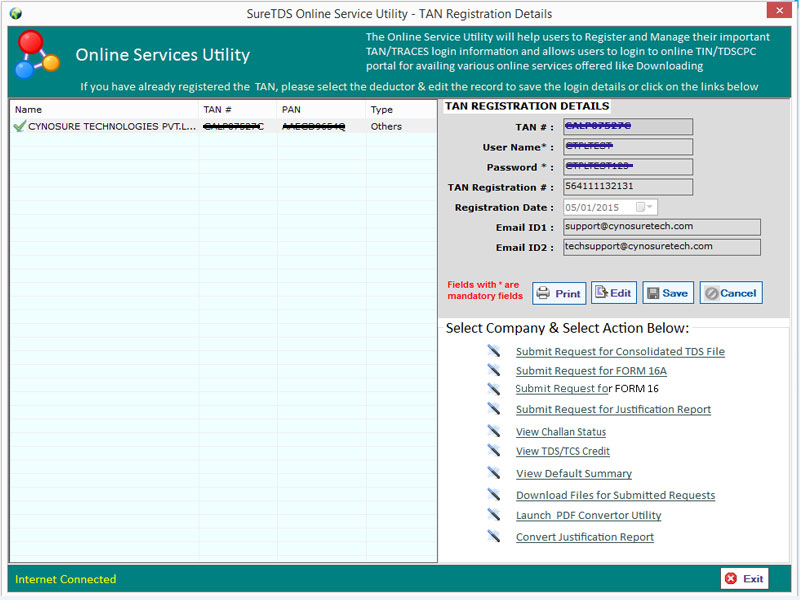 User should match the CD key entered on registration window with the CD key given on SureTDS CD. Error: At the time of registration of the product as ‘Existing User’ when I click on ‘Register’ button, a blank Error Box appears and after that my product is not being registered. Cause: Due to some network problem at your system this type or error can occur. 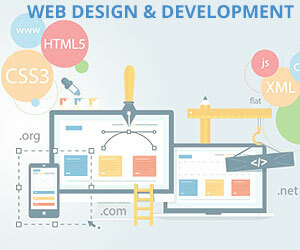 You should use the third option for register SureTDS software which is “Web Register User”. Solution: Go to www.suretds.com and login here with your registered login name and password. Download the license file from here and save it on the pc on which you are to register SureTDS software. Now at the registration wizard in SureTDS, click on ‘Web Registered User’. Enter your CD key and select the license file from your PC. At last Click on ‘Register’ button. Error: While Importing Excel Data the Import button is not highlighting on Import Summary window. Cause: It occurs when the excel file has some invalid data in it. Solution: A user should check all the cross marked entries on Import Summary Window. Select that invalid entry and Edit it. You'll see Total Invalid Records link there. 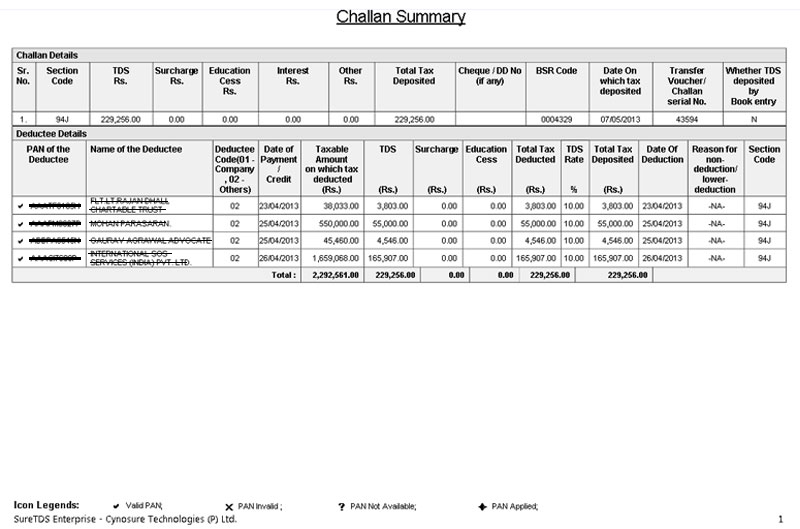 Click on the link which will help you to identify the invalid records. Error: After importing Excel templates, the data of excel sheet doesn’t show in SureTDS actually. Cause: This happens when you import the data without selecting F.Y. from SureTDS software. For Exp; if you are to import Excel sheet of F.Y.2015-16, then you must Select F.Y.2015-16 First showing at upper side of companies. If you are in F.Y.2016-17 and import excel sheet for other financial year, then NO data will shows after importing. Solution: You should select F.Y. first in which you are importing the data of your Excel file and then proceed ahead. 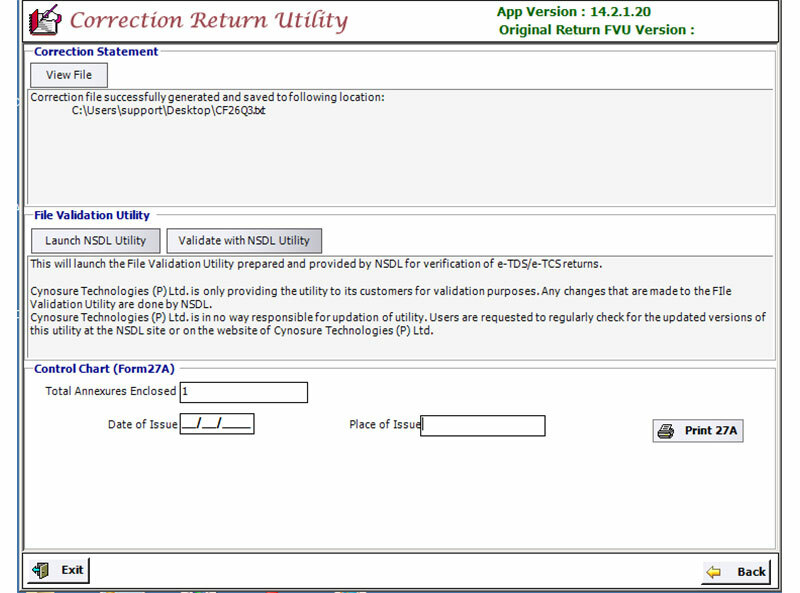 Error: How can I restore a particular company’s data only in SureTDS Enterprise software? Solution: You should use ‘Restore Company’ option from Utility Menu. From Restore Data dialogue box you should choose the company that you want to restore. Error: While restoring database in SureTDS with the ctbak file, I face an error "Database file is not valid". Solution: This error generally occurs when your software is not updated. Kindly update your software from SureTDS website and restore the database again. Error: While generating PDF certificates an error appears "No application is associated with the specified file for this operation"
Cause: All the certificates from SureTDS are generated and opened with Adobe Reader. If Adobe Reader is missing from your PC, this error will occur. Solution: Installed Adobe Reader on your PC to rectify that error. 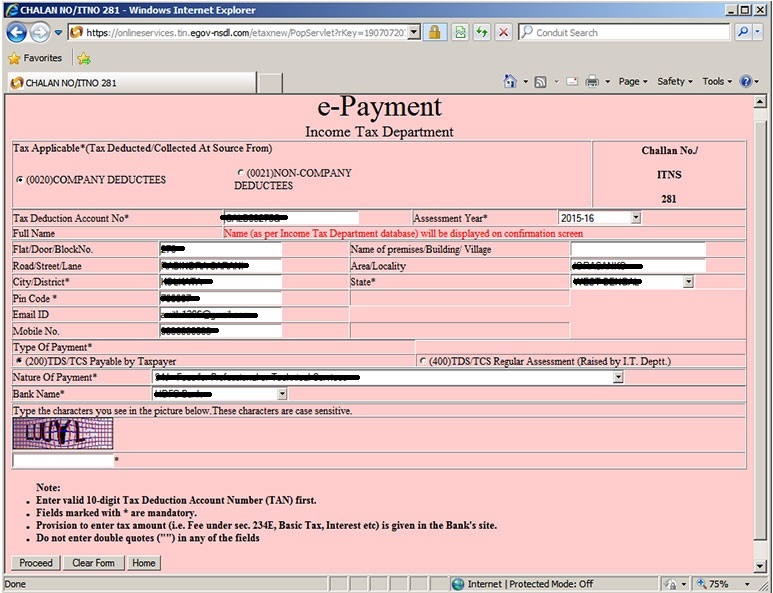 Error: When I going to print Form 16 there no employee is listed on Form16 window. Cause: This is one of the most common errors of the users. If employee salary heads, allowances or other perks details are missed from his Salary details then that kind of issue occurs. 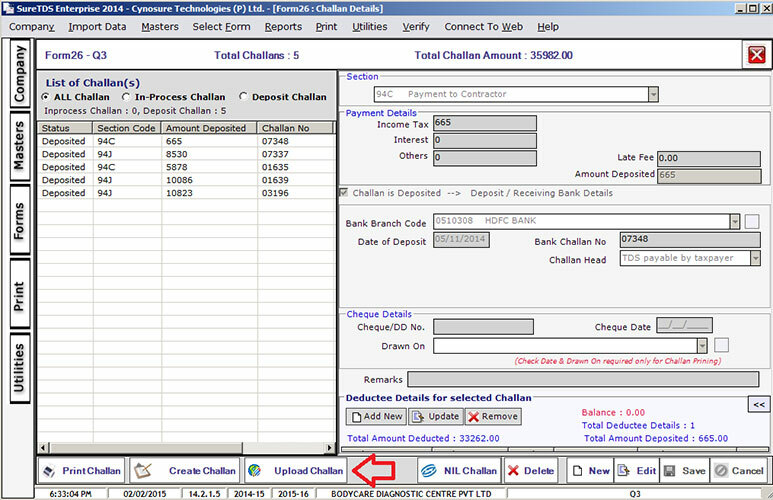 Solution: Go to Employee’s Salary details window and enter employee’s salary heads, allowances and other perks details by expanding the Arrow Icon showing on the window. Error: While launching NSDL utility SureTDS gets hang. Cause: File validation Utility is launched from TDS_FVU_StandAlone.jar file and opens with 'JAVA(TM) Platform SE Binary' software. If the associate program to launch File Validation Utility is set any other software, it will open with that invalid program and therefore the software gets hang. Error: At e-file generation process when I launch NSDL utility to validate my text file an "Access denied" error occurs. Cause: A user can face that kind of problem due to insufficient permissions on the SureTDS software to work in it. The error shows mostly in Window 7 OS. Solution: You should check the permissions assigned to user or right click on SureTDS icon and run the software as administrator user. 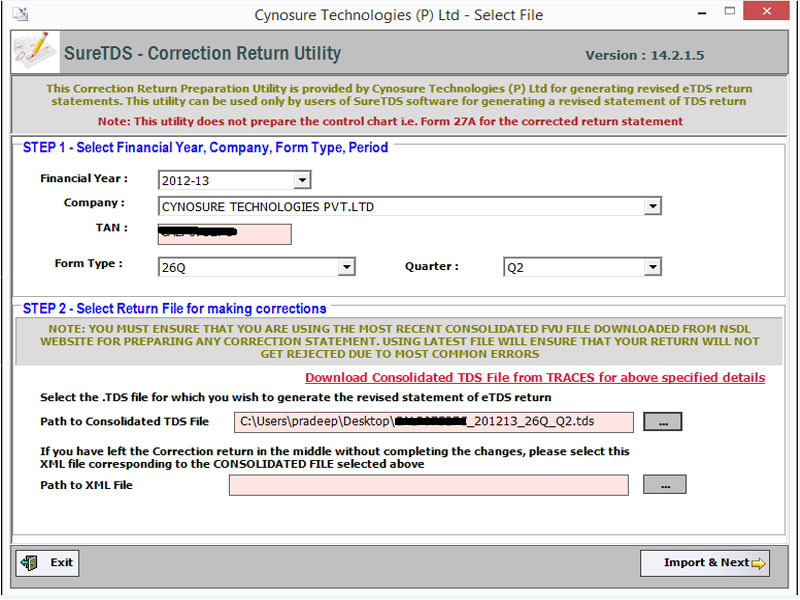 Error: SureTDS_Output folder is not created in SureTDS Program file folder after the successfully validation of e-file. Cause: After the successful validation of text file the FVU file is saved in SureTDS_Output folder which is created automatically in SureTDS Program Files by the software. Sometime due to insufficient permissions a window user cannot create such folder in program files. Therefore SureTDS_output folder is missed from SureTDS program file folder. Solution: Right click on SureTDS icon and run it as administrator once and then generate and validate efile. 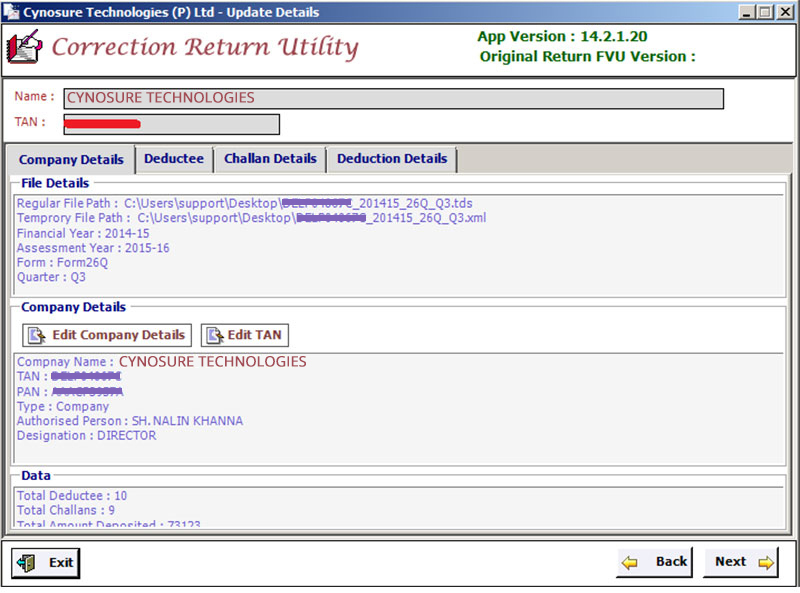 This will create SureTDS_Output folder and if you choose the default path while validating e-file, your FVU file will be saved under this path.